We offer a large selection of parts and accessories. Our showroom features the latest in Adventurer, Aliner, EverGreen, Forest River, Lance, Little Guy, Livin Lite, Northwood, Palomino, Travel Lite. If we don't have it in stock, we can find it for you. 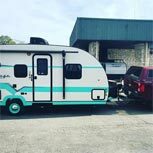 We can also assist you with customizing your truck camper, folding camper, tear drop, travel trailer and toy hauler. You get the most satisfying results with a plan for how you want it to look. We customize Adventurer truck camper, Aliner, Evergreen, Forest river, Lance, Little Guy, Livin Lite, Northwood, Palomino and Travel Lite all the time, so let us help you design yours! Stop by and enjoy friendly service for all your parts and accessory needs. Whether you have chosen your perfect camper or trailer, or you simply need to see your financing options, we are here to help you. We work with the nation's largest lenders to offer you the most competitive loans available. Just fill out the basic information on our secure credit application and our Business Manager will call you with information on all loan options. With finance periods ranging up to 15 years, we can help you find the payment that works for you. Most loans can be arranged in one day, giving you all the answers you need to begin your adventure. Still have questions about our financing options? Just give us a call at 800-338-7123. We will be glad to answer any questions or concerns.